It’s healthy, good for you, easy to make, no muss, no fuss, no clean up, and oh so luscious. Just package it up, toss it on the grill or pop it in the oven, pour yourself a cold one, relax, come back in 15 minutes and dinner is ready. Yeah, it really is that simple. En papillote, literally in parchment, is a downright simple way to prepare dinner. The entire process is quite simple. 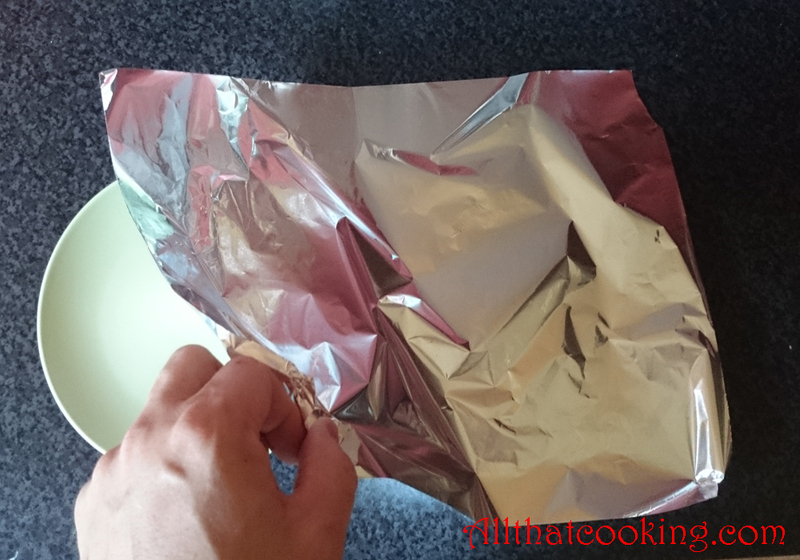 Cut a sheet of parchment paper into a large heart shape, place your veggies and protein (usually fish, because it doesn’t take long to cook) in the middle then begin to make small overlapping diagonal folds, twist the end and. . . What’s that you say? Parchment, cutting, making small folds is too much work? 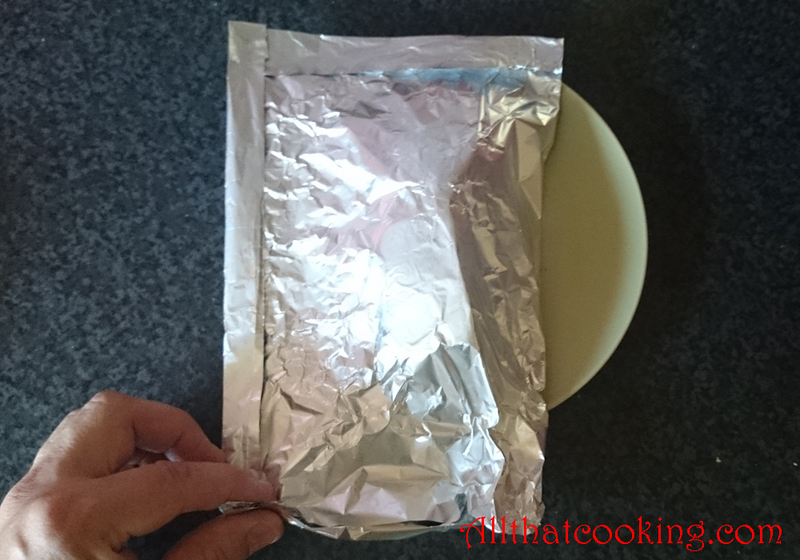 Ok, take a square sheet of aluminum foil, layer your vegetables and fish just a bit to the side of middle, splash it with some wine and fold the edges to make an air tight package. Place the packages on an oiled grill or in the oven and watch them puff. Easier? I think so. As the package heats, the air inside expands, making room for the flavors of the vegetables, herbs and fish to have a party. They mix and mingle and maybe even tango or polka depending on what’s in there, but the result is always perfectly cooked, moist, delicately scented fish with nicely finished vegetables. The fun part is opening the package (very carefully) and inhaling that first wafting bouquet of escaping aromas. Oli chose to keep this recipe simple. 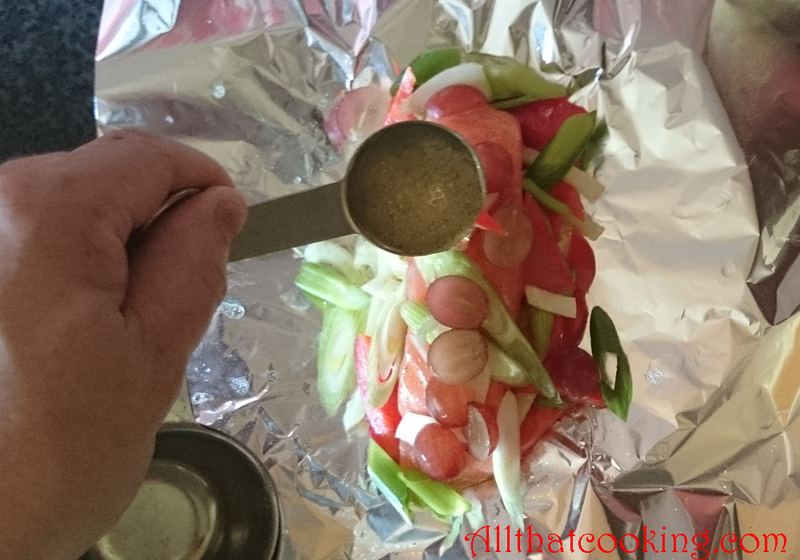 He made a bed of sweet and savory flavors from fennel, spring onions, bell pepper and grapes for a salmon fillet. A touch of white wine and a pat of butter (of course) create the right amount of richness. 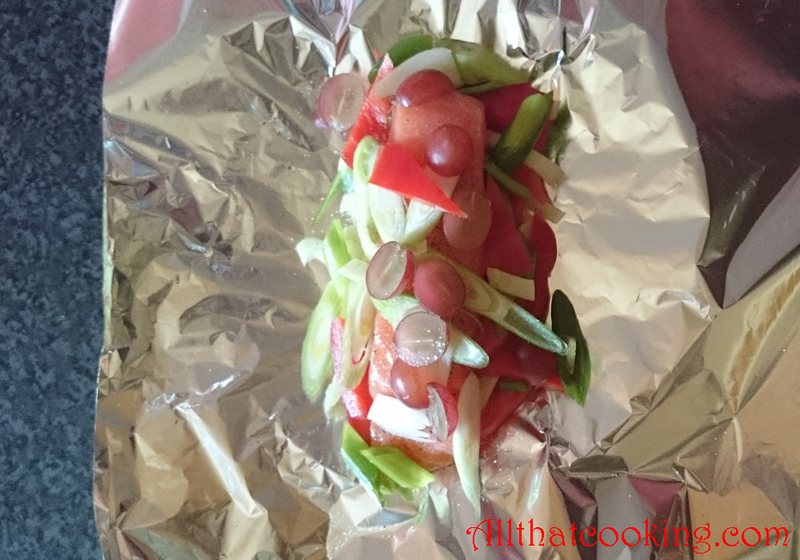 You can cook just about anything en papillote. Try shrimp, or maybe some thinly sliced chicken. Throw in some fresh herbs. Still have zucchini? Of course you do. Spice it up with some curry. Toss in some lemon grass, or ginger and maybe a splash of sake. Just keep the protein about 1/2 to 3/4 of an inch thick so that it is thoroughly cooked. Have fun and be imaginative. Enjoy the drama, oohs and aahs when your diners open their packages while you bask in the thought of no dishes to clean after dinner. These amounts are for 4 servings, so divide everything among 4 packages. To make life even easier, you can prepare the packages ahead of time and refrigerate until you are ready to cook. 1. 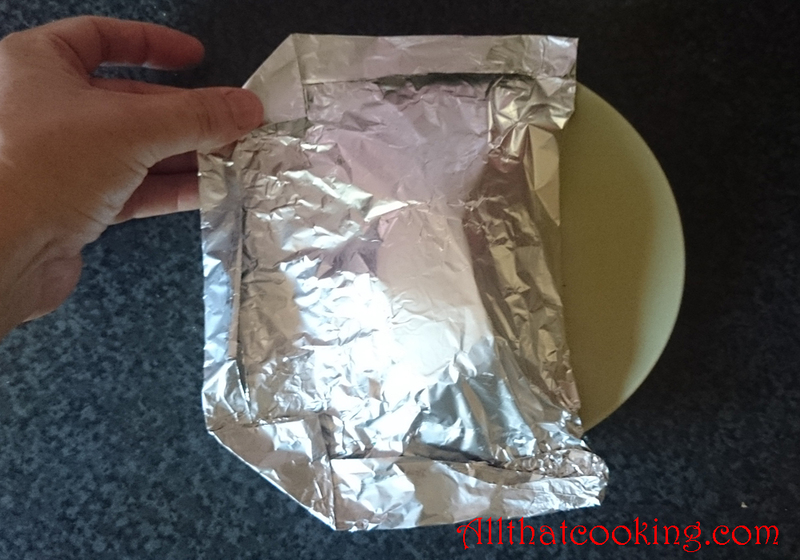 Place a sheet of foil on a large plate. This makes it easier to fold the package and more importantly keeps the wine from spilling out before you start folding. 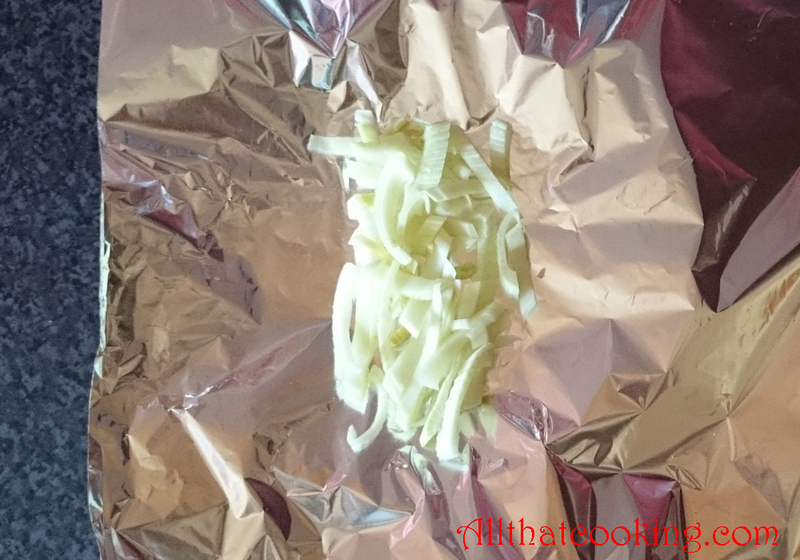 Start the layering by making a bed of fennel just off to the center of the foil. 2. Top it with the salmon. Dust with salt and pepper. Add a mixed layer of onions, peppers and grapes. 3. Splash it all with wine. Crown it with butter. 4. 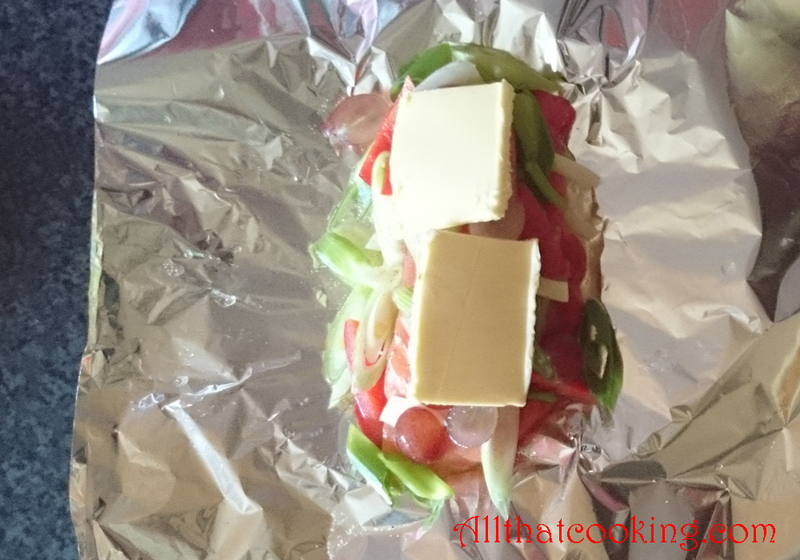 Gently fold the foil over the layered fish and veggies. 5. 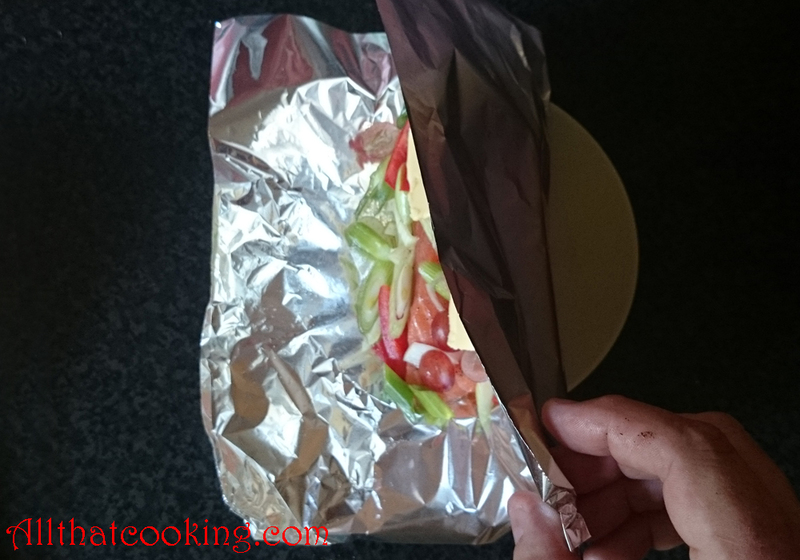 Make the package by folding the edges over at least three times. Make it tight, but do leave enough room for expansion. The package will puff up when heated and you don’t want it to burst. 6. When you make the last fold, turn up all of the edges. 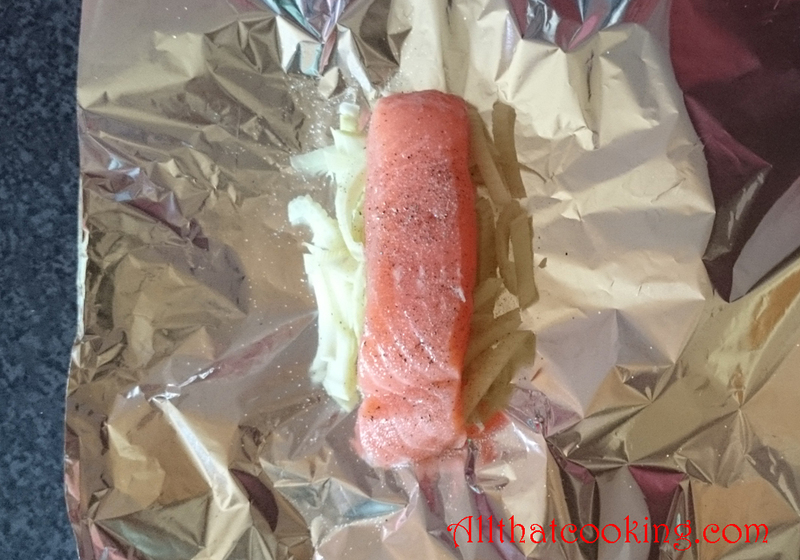 If you are baking, place the packages on a baking sheet and bake for 12-15 minutes depending on the size of the salmon. If you are grilling, place packages on the oiled grill and cook off to the side of the area of highest heat about 10 minutes. 7. 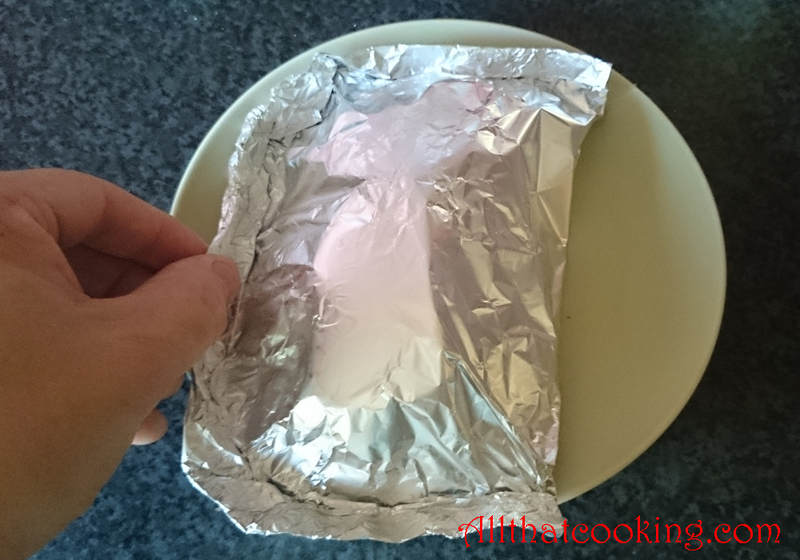 Arrange the packages on a serving dish and carefully cut a cross in the foil to open. Be careful – the steam is hot. Make a pretty garnish from some feathery fennel fronds (say that three times fast), a small bunch of grapes and either a small lemon half or lemon quarters. 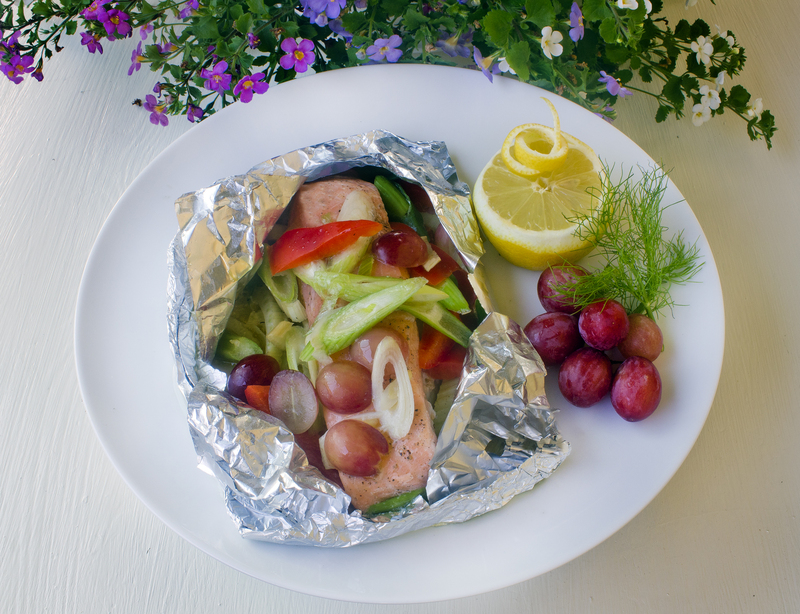 Gallery | This entry was posted in Grilling, Main Dishes and tagged dinner in a bag, easy meal, grilled salmon, no clean up meal, salmon en papillote. Bookmark the permalink. The salmon looks so fresh and tender. I really should use this method more to prepare my dinner. OK, so I didn’t have fennel, nor grapes, nor red bell pepper, but I was intrigued and inspired and just happened to have a 2.75 lb piece of salmon which begged for special treatment (not literally, of course, since it could no longer voice its preferences, which, come to think of it, would be to keep swimming). 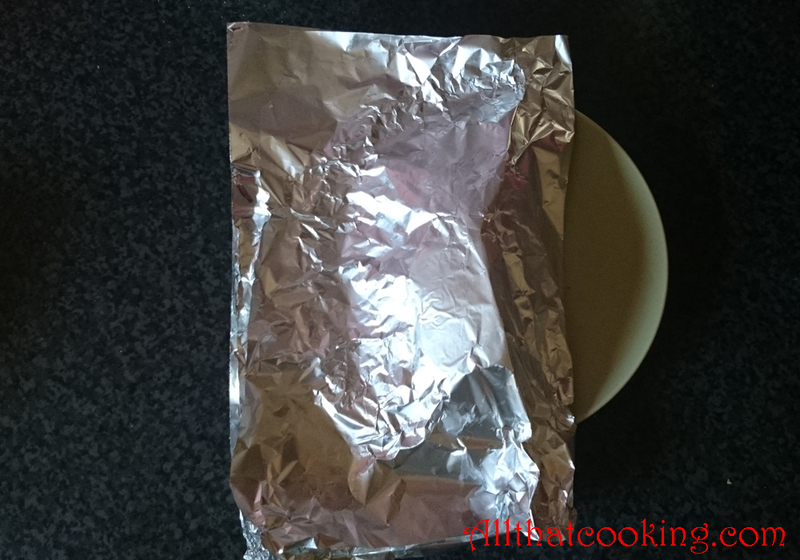 So, using your basic recipe, and adding what we had in the larder (ok, cabinet), I made a salmon en aluminium (sounds fancier than aluminum), and it was darn fine. But you don’t have to take my word for it; the kids kept coming back to the kitchen and eating it straight from the pouch. That is the best endorsement you can get. Thanks for the inspiration! I like grilling my salmon only on lemons, like I’ve learnt from that short tutorial: http://bit.ly/XgVr7E . I like so much that soft lemon flavour on my salmon. 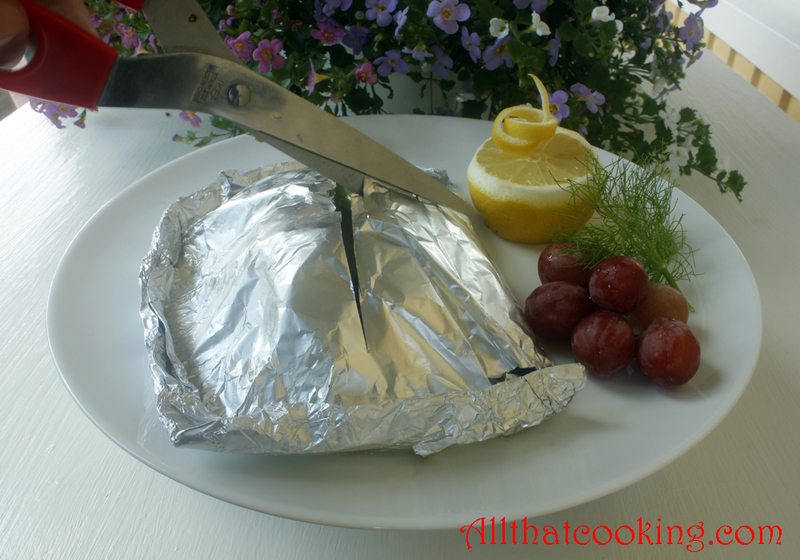 I agree, cooking/grilling your fish with veggies and in aluminium foil is the best and the fastest dinner solution!